Bejeweled for real money is not the game of Bejeweled that I hoped it would be. It’s basically a slots version of the game where you select your stake and hope to make as many combinations of different jewels as you can. You don’t get to move any jewels though. You just have to watch them drop from the top of the screen and hope you get lucky. Even though I never fully expected much (if any) interaction with Bejeweled for money, I’m still disappointed with the way the game has turned out. Other slot-style remakes like Jenga and Rubik’s Riches turned out to fun, addictive games. Bejeweled on the other hand looks as though it’s just trying to cash in on the brand. If you want to play Bejeweled online for money because you like the way the original Bejeweled game plays, I’m afraid that you’re going to be sorely disappointed with this offering. Bejeweled fun rating - 46%. If you take this real money version of Bejeweled for what it is (a slot-style game), it’s not all that terrible. The graphics are crisp and the big potential payouts are huge (£1,000,000+), which is only to be expected from any good slot machine. In spite of this, this version of Bejeweled isn’t addictive. Don’t get me wrong, I love the original version of the game and there is plenty of satisfaction in watching lines of jewels being formed. It’s just that compared to other slot-style real money games like Cubis, it’s not all that tempting to play another game. At the end of the day I’d much rather play Bejeweled for real money over the likes of Chain Reactors, but you’re left with that niggling feeling of disappointment when you consider how great this game could have been. Note: If you're after some actual online slots games, you may as well check out my friend's listings of the best slots online. Select the number of lines you want to play with (gor for the maximum of 10, it’s more fun that way) and your stake for each line. 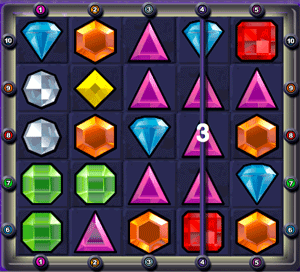 Watch the jewels drop and hope that you make lines of 3 or more jewels in a row. Real money Bejeweled plays a lot like the original, minus any interaction on your behalf of course. All in all the rules are mostly the same, so if you’ve ever played Bejeweled before this game shouldn’t be too unfamiliar. 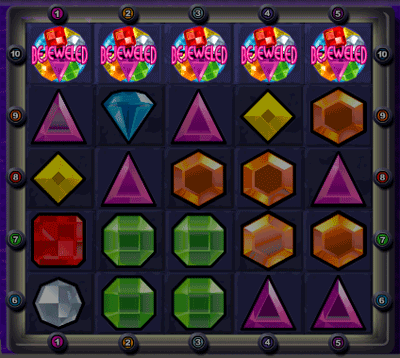 The aim of Bejeweled is to get 3 or more of the same jewels next to each other on a line. The winning lines of jewels can be made either horizontally or vertically, but not diagonally. Some jewels are more valuable than others (just like in real life), so if you can get a line of 3 or more of the more valuable jewels you will get a bigger payout than if you made the same line with less valuable jewels. In addition to this, the more jewels of the same type you can get in a row the better. A winning line consists of between 3 to 5 of the same jewels in a row. If you can get 5 in a row, you’ll receive a considerably bigger payout than if you managed to get only 3 jewels in a row. Fact: The rarer the jewel and the more of them you can get in a row, the bigger the payout will be. 5 Blue Diamonds produces the biggest payout (for standard jewels) of 500x your line bet. 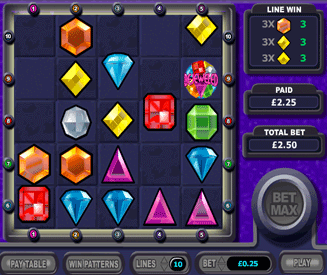 Jewels included in winning lines will then be removed from the grid. The surrounding jewels that were held up by the removed jewels will fall and move down the grid. The columns with empty spaces will then be filled up with new jewels from the top of the grid. These new jewels can go on to make more lines and win you more money. The game of real money Bejeweled ends when there are no winnings lines left. Honestly, I’m pretty sure each of these jewels in the game resemble real-life jewels like Ruby, Peridot and Topaz. However, as a bloke (about me) gemstones and jewellery isn’t my strongest point, so you’ll have to make do with my shoddy interpretations. There are actually two jackpots on offer in real money Bejeweled online. The normal jackpot = 8,000x payout. The super jackpot = 20,000x payout. The Bejeweled standard jackpot has a payout of 8,000x your line bet. To release the normal jackpot, you must have a winning column of five jewels on line 5 and another winning row of five jewels on any of the lines 6, 7, 8, 9 or 10. This means you should have a vertical 5-jewel column on the far right and a 5-jewel line on any horizontal row. Fact: Any type of jewel can be used to release the jackpot. As long as you have five of them on line 5 and five of them on any of the rows (6, 7, 8, 9 or 10) you are good to go. The Bejeweled super jackpot has a payout of 20,000x your line bet. 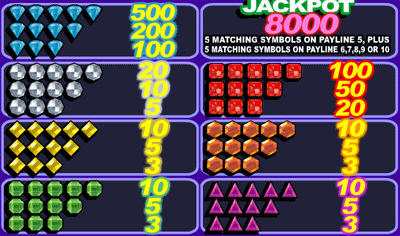 To release the super jackpot you must get 5 Bejeweled symbols on line 10 (the top row). This means that you must be playing the game with the maximum number of lines ("bet max"), otherwise line 10 will not be in play as a win line in the game. Note: If you get 5 Bejeweled symbols on any other win line aside from line 10, you will get a smaller payout of 1,000x your line bet. Quite a difference isn’t it, but better than nothing I suppose. I’ve already covered these a little, so they’re hardly a surprise. 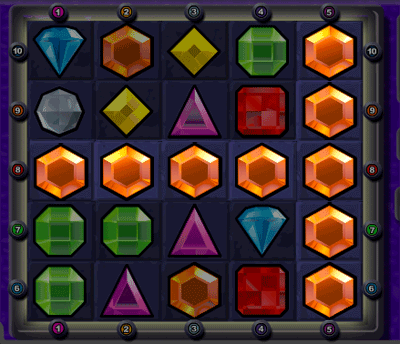 However, along with contributing toward the super jackpot, these Bejeweled symbols are also wild. Bejeweled symbols can be substituted for any type of jewel over multiple lines, so if you see a handful of these drop down in to the game you know you’re in for a good time.